I found this picture on Facebook and, while I was amused by it, it also holds a more serious side. The more I looked at this, the more I thought of all the "junk" that has ever been, and continues to often be, mixed in with true Christianity in order to (as I sometimes see it) try and make it more palatable to both us and to the masses. Have you ever done that? Have I? I wonder. Truth is, most of us would probably never admit it if we did. Was Paul's admonition here to Timothy because he was concerned that Timothy not fall into heresy? When we read between the lines, that does at least seem probable. Serious stuff to be sure! I suspect that when most of us think of "heresy" we think of the images from church history classes in which the institutional church of yesteryear condemned all sorts of heresies, such as Gnosticism and Montanism, and a host of other "ism's." Many of these people faced a gruesome death, even by the "loving(?)" hand of the church, simply because they thought differently than the orthodox status quo. 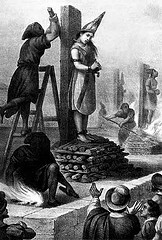 Fact is, to be viewed as "heretic" could, and often did, cost the perpetrator his or her life. The point is, "heresy" has historically been viewed as a pretty strong word and it is quite complex, but should it be? Now, we could argue back and forth the validity of burning someone alive at the stake for being a heretic (Yes, I'm being facetious), but have arguments ever really solved anything? Just like at times of war, are there really any victors? Even the winning side has many dead. Aren't we all heretics in someone else's eyes? But exactly what is "heresy?" I am convinced that often we tend to complicate things unnecessarily. Maybe we would do well to start with a basic definition. According to my dictionary, "heresy" is defined as "1. a belief different from the accepted belief of a church, school, profession, etc. 2. the holding of such a belief." If we use that dictionary definition as a guide, is it not possible to say that the church is full of heresy and heretics? One denomination holds to a certain set of doctrines, whereas the next one does not. According to our definition, each views the other as being guilty of heresy, even if they don't say so in exactly those words. If I think differently than you, then what I say is viewed as heresy. If you think differently than me, then your views become heresy in my eyes. Look at online chat groups. As sincere as people no doubt are in what they post, to others it makes the hair on the back of their necks stand on end. Maybe some of my own posts have even had that effect on you. Going back to our dictionary definition, that's "heresy," is it not? Aren't we all ultimately heretics in someone else's eyes? 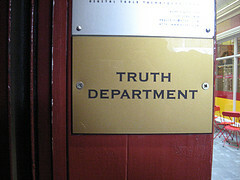 The problem is, truth is subjective. Even if it's wrong in the eyes of another, truth is often simply that which we've grown up in. Sit a Mormon down and ask him about a particular doctrine. Ask the same questions to a Buddhist and a Hindu, and what do you get? At the very least, you get three different definitions of truth. Now ask the Evangelical, the Charismatic and the Liberal the same questions, and you're likely as not going to end up with three more definitions. It all depends where people are coming from and the environment in which they were raised. Still, God's truth is absolute, despite all our heresies to the contrary. So why the countless different understandings, definitions and heresies? Perhaps because "Now we see put a poor reflection" (1 Corinthians 13:12). Is that too simplistic an answer? If so, why does it have to be more complex? 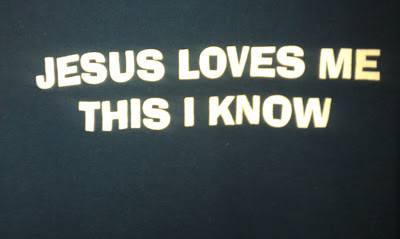 When I think of Jesus and the little children, I also think of that old Sunday School song, "Jesus Loves Me." I'm sure you remember it. Jesus loves me! this I know, For the Bible tells me so; Little ones to Him belong, They are weak but He is strong. From the back of a t-shirt that a friend gave me. How do little children come to Jesus? They do so with a simple faith that Jesus loves them. They look into his loving eyes; they feel his loving embrace. They completely trust him that everything's going to be OK. I'm taking some liberties here, but notice what they don't do? They don't argue theology. The don't discuss Jesus' recent transfiguration; they don't discuss his recent healing of the boy with the demon. No, for the child, it is enough to simply know that Jesus Loves Me. Do you know people like that? Simple and humble people for whom Jesus Loves Me seems to encapsulate their entire theology? What do we do with people like that? Ignore them and fellowship only with deep-thinkers like us? Ridicule them for being too simple? Or do we welcome them as Jesus welcomed them? Hmm, I wonder. Heaven help us, though, if we ever do anything to destroy that simple child-like faith of theirs! Jesus' warning for such offenders is pretty severe. Is it time to take a pill and chill out? Now I am not saying that doctrines aren't important, but if I "can fathom all mysteries and have all knowledge, and if I have a faith that can move mountains, but have not love, I am nothing" (1 Corinthians 13:2). I am also certainly not advocating Universalism. However, what I am saying is that maybe we all just need to take a pill and chill out a bit. 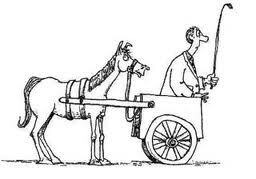 Maybe we need to put our theological carts back in their proper place, namely behind the horses as opposed to in front of them. Maybe before we worry ourselves too much with the heresies of others, we should be a little less hypocritical (Jesus' word) and take the plank out of our own eyes first (Matthew 7:3-5). 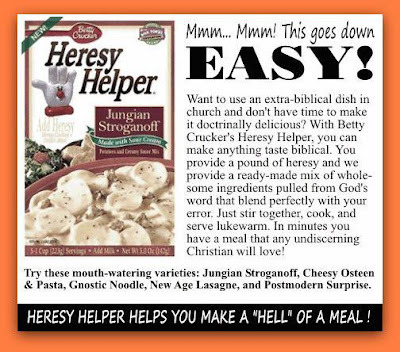 Maybe we really do need some "Heresy Helper." Maybe that "Heresy Helper" is really called LOVE. Maybe if we all focussed a little more on that, then each other's heresies would strangely become less and less evident too. Maybe that's even being a little more like Jesus. I get what you are saying but it is a little simplistic (albeit by design). Our love for God, and evidence for it, is found in our actions and relationships with others. 7 “Woe to the world because of the things that cause people to sin! Such things must come, but woe to the man through whom they come! Doctrine has to be well vetted through the Bible and reveal, or be consistent with, the character of God: the love you refer to. If it does not do this, it stands the risk of causing others to sin. So right doctrine is also important. As an example, a doctrine that teaches a wrong kind of love could lead to a wrongful conclusion to a question such as: Is hurting a masochist, "love"? Having a child-like trust in Jesus is absolutely important but we do not live in a vacuum and our understanding/misunderstanding of scripture, and the doctrines derived from that understanding, will have its impact on those around us. That impact could be positive or negative in terms of their relationship with the Living God, Jesus.